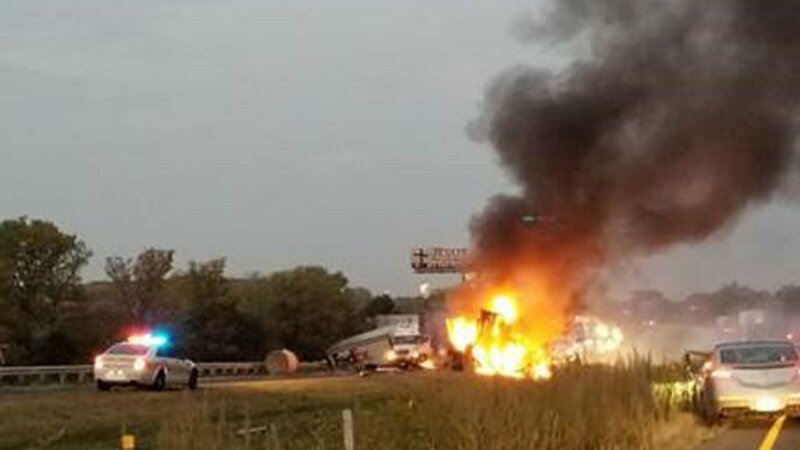 JOLIET, Ill. (WLS) -- A 46-year-old Chicago man was cited in a fiery, multi-semi crash that killed two people on I-80 in southwest suburban Joliet. The man was behind the wheel of a semi that veered off eastbound I-80 just after 6:10 a.m. Tuesday and struck a woman and two semis parked on the right shoulder at milepost 129, Illinois State Police said. The two semis on the side of the road were FedEx trucks. One of the FedEx trucks, which was pulling a double trailer, had broken down. It was driven by 49-year-old Jugoslav Djordjevic, of west suburban La Grange, state police said. A replacement FedEx truck, driven by 50-year-old Sami Guzick, of Joliet, was parked in front of the disabled semi. Guzick was outside the cab of her truck, helping with the vehicles, when the third semi struck her and burst into flames. She was pronounced dead at the scene by the Will County coroner, ISP said. Preliminary autopsy results revealed she died of multiple injuries she suffered in the crash. Djordjevic was airlifted to Loyola University Medical Center, where he died Wednesday, state police said. An autopsy found he died of full-body burns in the crash, and his death was ruled an accident. The 46-year-old Chicago man was also transported to an area hospital with serious injuries. I-80 was shut down for more than 10 hours as crews cleared the scene and the Illinois State Police Reconstruction Unit conducted its investigation.